I know that the liquor license protest that is currently ongoing against the Cardinal's Nest is to be on the agenda and if anyone is interested in attending, please do. As I mentioned in a post last month, the Cardinal's Nest - which is going to be a cyber cafe on 10th Street across from the Turkey Thicket Recreation Center (in the old video store) - wants to be open until 2:00am most nights of the week and until 3:00am on the weekends. Those of us who live steps from the place think these hours are far too late for a coffee shop (especially one with a liquor license). The next status update with the ABC board will be the second week in October regarding the protest. Thanks. P.S. It appears that the place opening up in the old Johnny K's on 12th Street is actually called the Cardinal Club which is different from the Cardinal's Nest. They are also applying for a liquor license. Around 4:45pm Wednesday, September 20, 2006, near Rhode Island and Montana Avenues, NE, a group of juveniles threw either rocks or a brick through a window in the bus. One of the juveniles proceeded to push a gun through the broken window and fire off two rounds. Between 15 and 35 people were on board, and no one was injured. It is believed that the intended target was a group of teens that likely boarded the bus at the Rhode Island Avenue Metro. Before transit police were able to get involved, all of the passengers (i.e. witnesses and potential suspects) were dropped off at their respective stops. I will be terribly impressed if the authorities are able to get any leads now that everyone involved is scattered. The curfew couldn't stop this; gun control couldn't stop this. Being proactive in our children's lives can. It really does take a village, and anyone who finds that trite or cliché is no better than the problem at hand. This month's is chock-full of development. • Paul Tummonds, Community Amenities Package for "Fairfield at Capitol Commerce Center"
I pretty sure I didn't miss a listing for this somewhere else...This morning while riding the Metro I came across a blurb entitled "Transforming 12th St., NE" in the Express (it's also in this post on their blog, "Free Ride"). Yay, I think, media coverage for the Brookland Main Street Initiative (informative PDF here)! The problem is, I know a lot more of us are interested - even those of us that live 10 or more blocks away - than are able to make a meeting on seemingly random Thursday morning. To that I say, "Boo!" What: Brookland Community Development Corporation and the Office of the Deputy Mayor for Planning and Economic Development are holding a meeting for those interested in the ongoing improvements along Brookland's "main drag," 12th Street, NE. Random musings/ranting: Why is Rhode Island Avenue, NE from Eastern Avenue in Woodridge to 4th Street, NE near Edgewood (certainly one of the gateway corridors to and from Maryland - just check out the tags of the cars parked M-F at the RI Ave. Metro) not a part of the "Great Streets Initiative?" A sliver of Benning Road, NE is all Ward 5 gets for now, though it's worth a peek at Target Area #8 of the Neighborhood Investment Fund (Woodridge be damned!). 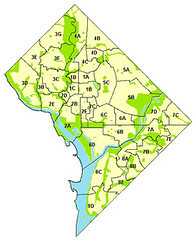 Areas in Ward 5 and/or Northeast also targeted for the Neighborhood Investment Fund are #1-Shaw, #3-Deanwood Heights, #7-Bloomingdale/Eckington, and #10-H Street NE. The Brookland CDC and I would like to invite all neighbors in the greater Brookland area to attend the next Festival Committee meeting at 7:00 pm this Wednesday, September 13th, at the Brookland Visitors Center, 3420 9th Street NE. The Brookland Festival and Parade will be taking place on Saturday, October 7th along 12th Street from Monroe to Otis. We are making great progress with planning this event but we could always use more volunteers to help with the final tasks! So if you are interested in making the Brookland Festival a fantastic event this year, please join us this Wednesday evening. Please bring school supplies to this meeting to help homeless children in the local community shelter. Don't Forget the ANC Elections! Where there's no names someone should run. Where there's one name, two more people should run, and so on. We need strong ANCs. They are our first level of government. If you want safe streets, economic development, better city services, better quality of life you need strong ANCs. Its not too late to run! You have until Friday to turn in your petitions. A number of SMDs have no candidates to date, including mine. Take a look at yours: 5A, 5B, and 5C. Kris Hammond is utilizing the blogosphere in his bid against incumbent Cleopatra Jones for ANC 5C-02 Commissioner. DC Blogs noted today, "Win or lose, this neighborhood will gain if Hammond keeps his blog." I concur. Hmmm, any takers for adding me as your write-in candidate for 5A-09 on November 7th?